Just as on a traditional acoustic piano, the keys of the lower notes have a heavier touch, while the higher ones are more responsive to lighter playing. The attractive, slim, lightweight design of the instrument -less than 12 kg- suits virtually any interior décor, and occupies less space than most coffee tables. No piano movers required. The AWM (Advanced Wave Memory) is a sampling system which creates sound close to that of an acoustic instrument by using digital technology to record the instrument sound and applying high-quality digital filter technology to the recorded audio samples. AWM Stereo Sampling creates a more spacious, deeper, and richer sound by using a pair of waveforms (L and R), obtained via a stereo recording process. 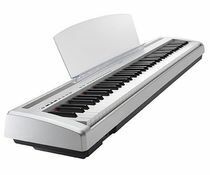 This instrument features an array of commonly used sounds such as grand pianos, electric pianos, organs, harpsichords, vibraphones, and strings. Each of these sounds has been recorded and recreated with Yamaha's unrivaled attention to detail. This instrument uses highly efficient amplifiers that pack more sound into a lighter digital piano. With 6 watts per channel, these keyboards are ready to go whenever you are. TI SERVE QUALCHE ACCESSORIO ? Impermeabile, imbottita e con cuciture di qualità. Panchetta icon imbottitura alta per una maggiore comodità. Panchetta per pianoforte con seduta in sky nero. Speaker da 40mm che garantiscono qualità e dinamicità sonora. Con SPEVI acquisti in totale sicurezza.